Soul Slings have been on my radar since I first saw them on Instagram about a year ago. Upon first glance, I thought immediately of a Sakura Bloom. Their single and double layer cotton slings were gorgeous – very classy and well made. I wanted one immediately. The only problem, was at the time Soul Slings were being produced in India, and had not passed the mandatory testing to be sold in the United States. Well, good news ring sling lovers. They have passed their testing and are now available for purchase here in the states! 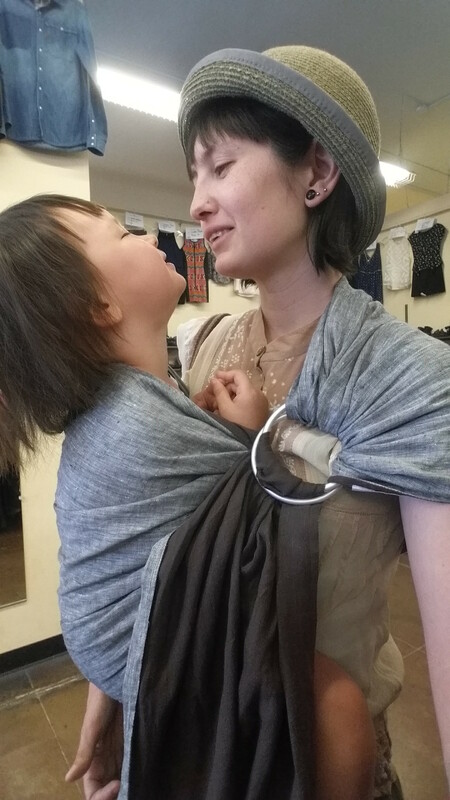 I was beyond excited when I was sent one of their Walnut Chambray Double Linen Gathered Shoulder Slings to try out with my 3 year old. 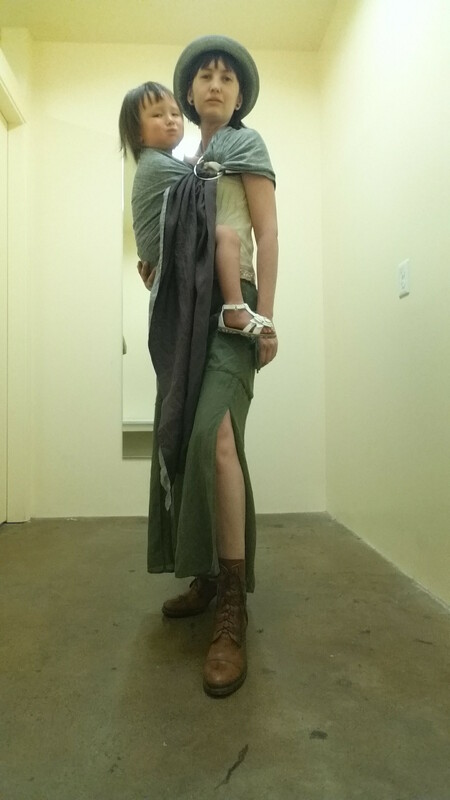 I definitely lean towards linen ring slings when I am looking for toddler support. 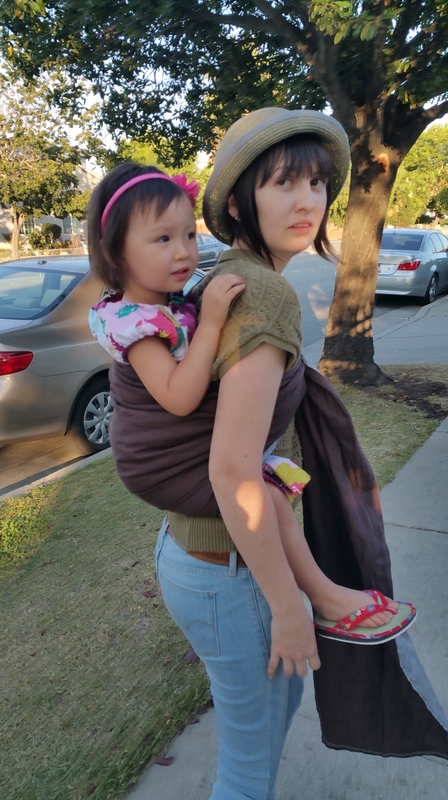 The Soul Sling is 28” wide, a nice size for use with a larger toddler. A one-shoulder carry is not always the best choice with my 30 lb kid at this point, but some occasions really call for it. It is way more practical at the Doctor’s office, or on a trip to the Bank where I want her to be intimately involved in observing what I am doing at the moment. The Dragon baby would pick the ring sling every time if given the choice, she loves being “on the front!” So, we tried it out on a trip to Crossroads Trading. Toddlers have lots of opinions on secondhand fashion (No? Only my toddler? Sigh. ), and she was very interested in sharing hers. I wore her for about 45 minutes in the sling, as we walked around shopping the racks together. The sling remained comfortable, the gathered shoulder really helping to distribute the weight nicely across my back. Even though the linen was very thin, it was not digging at all. My daughter found it quite comfortable as well, neither of us were feeling overheated despite the 95 degree temperature in Sunny California. I highly recommend checking this brand out if you come from a hot climate, and are looking for something that will work in the hottest temperatures. I wanted to try it out in another carry, but there are only so many you can do with a 3 year old in a ring sling. So I wore my toddler out for our evening walk in a Soul Sling back carry. 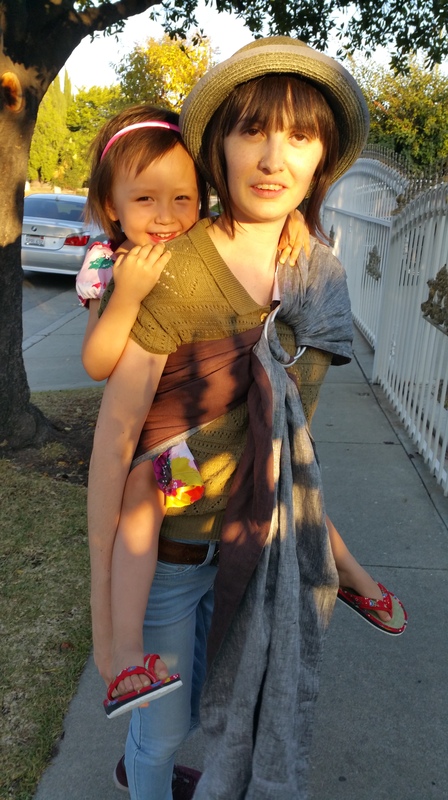 If you didn’t know you can do a back carry in a ring sling – surprise! You can. Educators consider it a more advanced carry though, so please get some help learning it – or practice over the bed a couple dozen times with your most cooperative wearee before giving it a go in public. My daughter pretty much never resists going up these day… I’m a lucky gal. Anyways, back to the sling. The carry was really comfortable! The linen stayed in place nicely for the length of the walk. Again I experienced great support, no digging, and nothing but approval from the Toddler reviewer. Did I mention the sling is reversible? Both sides were so beautiful! They colors were rich, and went well with everything in my wardrobe. Their color choices are just impeccable. Considering how low the cost of these slings are, the fact that you are basically getting 2 different looks for the same price is just one of the many many reasons I am growing so fond of this brand. I have brought this tester to multiple Babywearing Meetings in our area, and it has received nothing but praise from everyone who has had the opportunity to try it out. 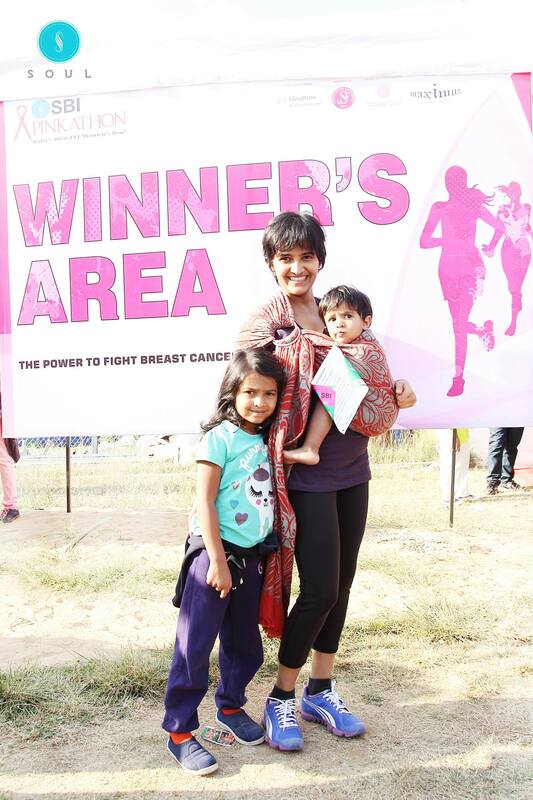 Chinmayie, owner of Soul Slings and her beautiful littles. The owners of Soul Slings, Chinmayie and her partner Ravindra are gentle parenting advocates. They are a small family owned company, based in Bangalore. Chinmayie is passionate about breastfeeding and babywearing – she wears her children and is active in their local babywearing community. 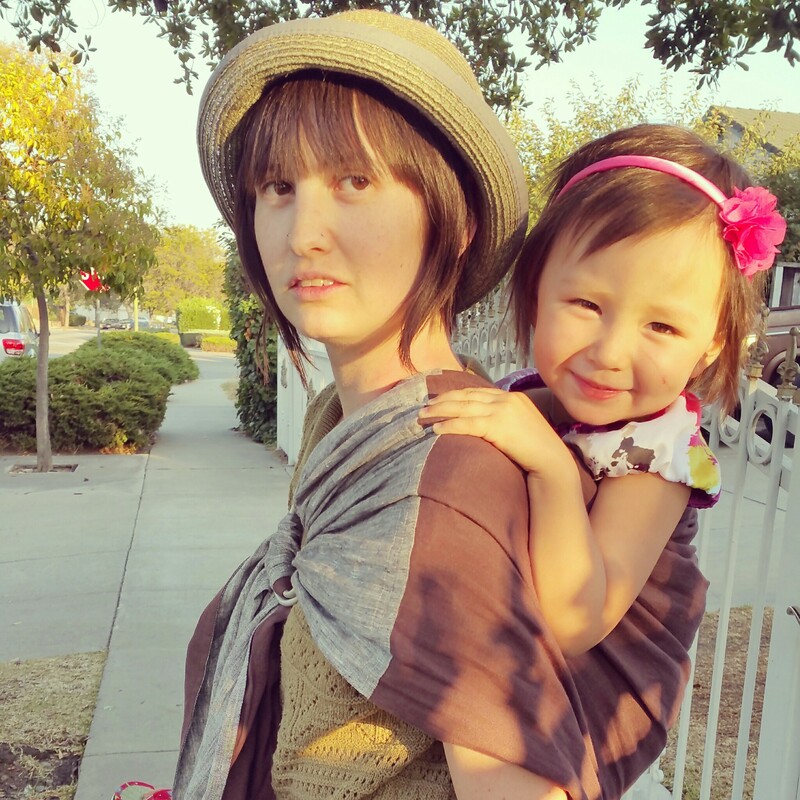 She has worn from her early days as a mother, and has always believed in the power that Babywearing has to change our world through child rearing. She was inspired by the beauty of the ring slings she was seeing available in the U.S. and European markets, and set out to make a brand that would be accessible and affordable to caregivers in her home country. Thus, Soul Slings was born. They have grown over the past year, and have begun to experiment with Soft Structured Carriers, Mei Tai’s, and Woven Wraps. Soul Slings works with local artisans that have been weaving fabrics for generations, and they are passionate about contributing to their local economy. They have fair trade agreements signed with all their fabric producers and sew houses, and they are frequently visiting all the sites they source fabric from. They have recently released a line of handwoven ring slings, that are just beyond stunning. Above all, Chinmayie is fervent about keeping the costs of her products low. 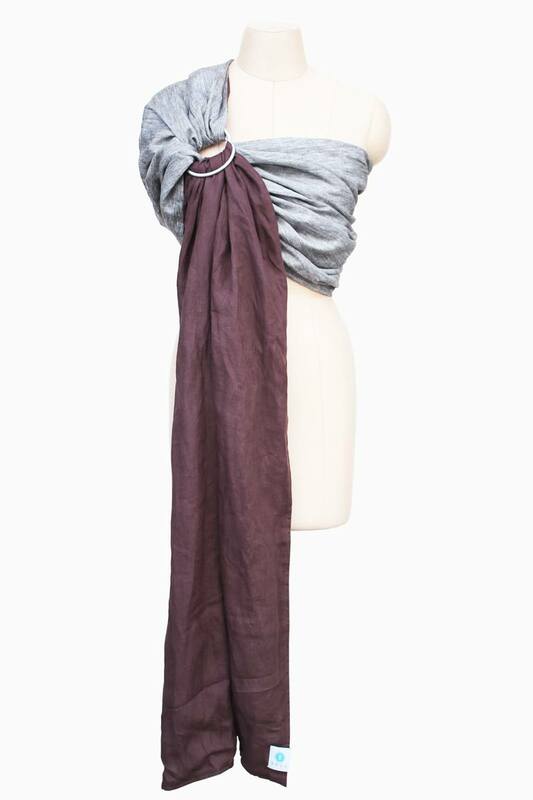 A double layer linen sling will run you about $45 US before shipping from India. They fit squarely into the budget category. To have such a beautiful sling at such an affordable price point, really speaks to their dedication to providing a stylish product that every caregiver can afford. If the international shipping really has you fretting, don’t worry. Rumor has it one of my favorite Budget Retailers is going to be stocking Soul Slings very, very soon – so be watching their page for that awesome addition. We love this Soul Sling!